Ireland’s Recycled Waste Statistics – Rubbish ? 2009-01-30: On Wednesday last, 28th January 2009, Ireland’s Environmental Protection Agency (EPA) launched the ‘National Waste Report 2007’. As usual, a Press Release accompanied the launch … and the contents of this Release are still beginning to appear in our national media. You may also have caught some interesting waste-related newspaper articles just after Christmas. It was those which really started my mental wheels turning. Congratulations to Ms. Sylvia Thompson in The Irish Times (2008-12-30) ! Between 2001 and 2007, the total amount of waste (in tonnes) produced by this country – all of us together – under each of the ‘selected’ four categories shown in Appendix A – Indicators on Page 33 of the recent EPA Report, i.e. municipal, household, commercial and packaging … has increased dramatically. Not only are we dirty, messy creatures on this beautiful island, but it is also clear that a much heavier, and more effective, regulatory hand is required to get to grips with this increasing problem. We suffer from too many national marketing campaigns and too many national voluntary schemes … which “don’t amount to a hill of beans”, as John Wayne grunted many years ago. But, just how ‘useful’ are the numbers we were presented with on 28th January ? – It took 13 Months to produce the National Waste Report for 2007. Having had a brief conversation with a key person in the EPA (who shall remain nameless), I know that there are all sorts of reasons why this continues to happen year after year. But, the time lag is ridiculous, and unacceptable. To be ‘useful’, we need Reliable Waste Data and Statistics far, far sooner. For example, if this Report had been ready for mid-September 2008 … National/Local Waste Policies and Budgets could have been adjusted in time for the start of 2009. Does that make sense ? – In 2007, we did not recycle 36.5% of household and commercial waste. We recovered this percentage of waste. If, however, you were then to apply the following criterion … how much of this waste was actually processed for recycling within the island of Ireland and in a location no farther than 75 Km from the point of recovery … how quickly do you think the figure of 36.5% would nosedive into the ground ??? To be ‘useful’, we need a more developed Waste Indicator Set which will reveal the complete picture on national performance. – With Tables 5 & 6, on Page 7, firmly in the back of your minds … how ‘sustainable’ is it to be exporting our waste to countries as distant as China, India and the USA ? This forces me to ask a strongly-linked question … does anybody within the EPA, or at the higher levels of any of our National Institutions, really understand the word ‘sustainable’ ? Looking at the Environmental Aspects of Sustainable Human & Social Development, alone, is a pointless exercise. In the long-term, it is actually counterproductive. To be ‘useful’, we need Waste-related Environmental Indicators which are properly integrated into a Multi-Dimensional Matrix which also contains Waste-related Social, Economic, Institutional, Political and Legal Indicators. Put very simply … our Aim should be to use as close to ‘real time’ Performance Indicators as practicable, with Benchmarking at Year 1990 … to target ‘real’ improvements in Ireland’s Sustainability, verify Target Attainment, and to continually re-adjust those targets at appropriate intervals thereafter. 2009-01-11: Claude Monet (14 November 1840 – 26 December 1926) devoted the last twenty five years of his life to painting the water lilies which floated on the large pond at the bottom of his garden at Giverny … in Normandy, France.There are approximately 250 ‘Water Lilies’ in this series. 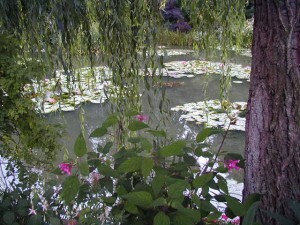 Colour Photograph of ‘Water Lilies & Willow Tree’ in Claude Monet’s Garden at Giverny, Normandy. Click to enlarge. Photograph taken by CJ Walsh. 2004-08-29. 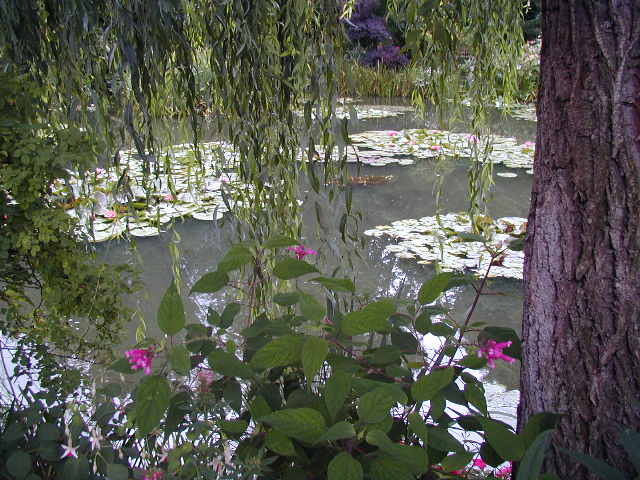 This photograph was taken on 29 August 2004.It shows those same water lilies on the pond, and that same willow tree by the bank. Please enjoy. Israel a Criminal State ? Guantánamo Bay an Illegal Occupation ? 2009-01-01: Sustainable Human & Social Development is much more than an academic theory. It is a necessary concept for our troubled times … in our global community. Intricate, open, dynamic and still evolving … it is very much intended for practical implementation. – 2006 Convention on the Rights of Persons with Disabilities (UN). Sustainable Design is the ethical response, in built and wrought form, to Sustainable Human & Social Development. As our understanding of ‘sustainability’ develops, so too must ‘design’ (spatial planning, architectural/engineering/industrial design, and e-design). We see on our television screens and hear from our radios that the Israeli Defence Forces (IDF) are again committing criminal acts in Gaza. These acts are authorized by the Government of Israel. The country’s population continues to vote these Governments into power. The USA’s treatment of prisoners in Guantánamo Bay was, and still is, degrading, inhumane and criminal. Beyond that, however … the annexation of the bay area remains, to this day, an international act of piracy (refer to the 1901 Platt Amendment and later ‘treaties’ with Cuba procured by the threat or use of force). The USA and British fundamentalist western crusade against the regime and peoples of Iraq was a cynical act of barbarism and a crime against humanity. We look forward to the day when George W Bush and Tony Blair will be brought before the International Criminal Court (ICC). Accessibility of buildings for people with disabilities, to take just one example, is now a legitimate social right which must be protected and nurtured, i.e. properly resourced, by all States Parties to the 2006 UN Disability Rights Convention. People must be able to independently approach, enter, use, egress (under normal conditions) and evacuate (in a fire emergency) any building in our built environment. A radical overhaul of the Education and Training of any person connected, directly or indirectly, with the design, construction, operation, management, servicing or maintenance of our Human Environment. The widespread introduction of Sustainability Impact Assessment (SIA) at all levels of our Public and Private Institutions. SIA is a continual evaluation and optimization process – informing initial decision-making, or design, and shaping activity/product/service realization, useful life and termination, or final disposal – of the interrelated positive and negative social, environmental, economic, institutional, political and legal impacts on balanced and equitable implementation of Sustainable Human & Social Development.